The Imperial Russian army created by Tsar Peter I (the Great) ceased to exist in early 1918, a few months after the Bolsheviks seized power in the October Revolution. As the country descended into civil war between the Reds and pro-royalist Whites, the single standard issue uniform caused chaos until the Soviets restyled the workers- and peasants-at-arms. After the Romanov dynasty was toppled, but before the royal family met their violent end in July 1918, Russia’s new authorities announced the formation of the Red Army. The decision was more a simple statement of fact, since by the end of 1917 the imperial army had virtually disintegrated. World War I had led both Russia and its army into a hopeless morass. Russian soldiers refused to fight in the trenches and deserted in droves. With the outbreak of the Civil War (1918-1921), both sides ordered the creation of new organized armed forces, with unified command and supply as well as standard uniforms. During the years of the World War I, the Tsarist government stockpiled huge amounts of military uniform, with no shortage of greatcoats, shirts and footwear. If it wanted, the Red Army could have clothed several million troops at once. However, the main problem was that the White Russian forces were wearing those exact uniforms. In 1918, there were numerous instances when, during shifts in the front line, Red Army units only knew they were among the enemy when they started speaking with them. To identify friend or foe, the Red Army introduced a badge showing interwoven laurel twigs set on a red star. A crossed hammer and plough emblem in the center underscored the kinship of the workers and peasants with the people. But the most distinctive and widespread element of the Bolshevik uniform was the budenovka felt cap, designed earlier as ceremonial wear for the anniversary parade of the still ruling Romanovs. Named after decorated World War I and early Soviet cavalry officer Semyon Budyonny, the cap’s design was modeled on the ancient helmet of Kievan Rus’. Intended to inspire the troops through association with legendary heroes of old, the pointed, brimmed budenovka had folded earflaps that buttoned under the chin in cold weather. A large star was sewn on its brow, dyed red for infantrymen, blue for cavalry and orange for the artillery. The Red Army was founded on very different ideological principles to the Tsarist forces. There was now no place for an officer corps, which was regarded as a relic of authoritarianism. But since no army can exist without command, lead positions were retained under other names, for example a colonel became a komot – kommandir otdelenia, or squad leader; and a general became a komdiv, or division commander. The highest former rank, marshal, became commander of the army. The distinctive officers’ uniform elements such as aiguillettes and shoulder straps were abolished and replaced with new insignia. Rank was now denoted by the number of triangles, squares or diamonds sewn on shirt and overcoat sleeves and flaps, and these also varied in color depending on the military branch. Over time, however, the Soviet military uniform lost the original elements of the revolutionary era and reverted to the lines of the Tsarist army. In 1924, all sewn-on insignia were removed, and only an officer’s lapels showed his rank, also using squares, triangles and diamonds, but now smaller and made of metal. 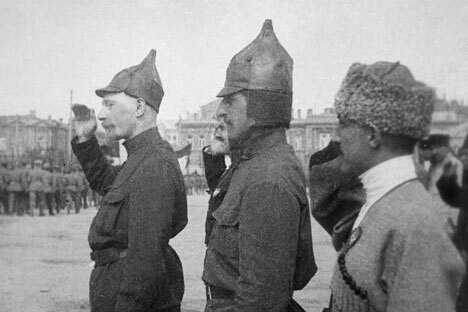 A flat peaked cap with a red star replaced the budenovka for all branches and ranks, and line units were issued 1916 design imperial army metal helmets. All military personnel received khaki uniform pants and tunics with the inside collars lined with a white cotton strip to avoid abrasion. The army command regained a number of distinctive former features. On the eve of World War II, traditional military ranks replaced revolutionary ones, and generals and marshals reappeared in the Red Army, with jackets sewn with red chevrons and gold braid. Officers were allowed to bear side arms for the first time since the Revolution, and the imperial officer’s headdress re-entered regular service, a change that was especially well received by the cavalry. But epaulettes were not reintroduced until much later. Finally, and looking effectively forward rather than back, a new modified greatcoat was issued that went almost unchanged until the early 21st century, when Russian soldiers wore much the same winter clothing as their forebears in the 1920s.